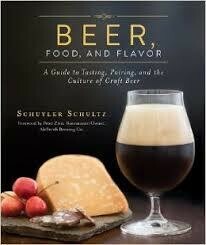 “Yes, great beer can change your life,” writes chef Schuyler Schultz in Beer, Food, and Flavor. Here is your authoritative guide to exploring the diverse array of flavors found in craft beer—and the joys of pairing those flavors with great food to transform everyday meals into culinary events. Armed with the precise tasting techniques and pairing strategies offered inside, participating in the growing craft beer community is now easier than ever. Beer, Food, and Flavor will enable you to learn about the top craft breweries in your region, seek out new beer styles and specialty brews with confidence, create innovative menus, and pair craft beer with fine food, whether at home or while dining out.